“To give people better appearance and make them happy”. We combine art and science so that we can achieve this goal. Hair is perhaps the most important factor that affects our aesthetic appearance. The key motivation for us is to ensure that people who experience pattern hair loss regain their healthy hair they had in their 20s. 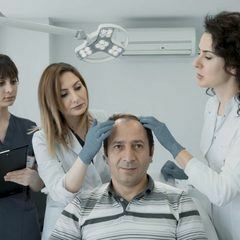 DK Klinik provides treatment not only in hair transplant but also in aesthetic surgery and dermatology, treating thousands of people from various countries in the world. We have brought our expertise in different procedures including Botox® treatment, lip augmentation, non-surgical facelift, and stem cell therapy, into our hair transplant unit. This knowledge transfer enables us to deliver you the best service possible. Dr. Meltem Şentürk became a medical doctor in 1994 and then a dermatologist in 2000, working at Antalya State Hospital from 2000 until 2009. She was awarded the Certificate Dermato-Cosmetic Sciences, a widely recognized qualification across Europe, upon successful completion of her education in advanced dermatological procedures at Vrije University, Belgium in 1998. 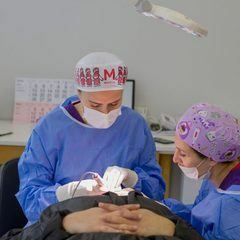 After founding the DK Klinik in 2002, Dr. Meltem Şentürk resigned from her job at Antalya State Hospital in 2009 to devote her full energy to the DK Klinik. Meltem Senturk is an active member of the Turkish Dermatology Association and the Mediterranean Regional Dermatology Association. 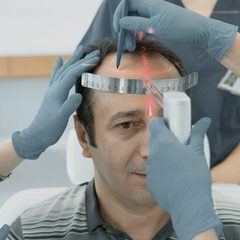 The founder of our clinic, Dr. Meltem Şentürk carefully and meticulously carries out the planning of hair transplant, analysis of blood tests and dermatological analysis of the scalp. 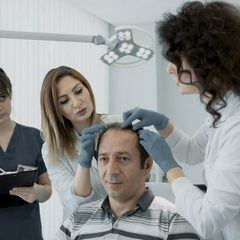 During hair transplant surgery, a doctor specializing in hair restoration surgery along with our nurses actively participates in the hair transplant procedure. If you are planning to receive a hair transplant and currently doing research on the topic, one of the toughest questions you must find an answer to is “Which hair transplant technique should I choose?”. 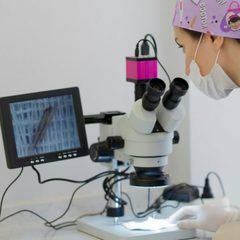 Several methods and techniques that you may come across while researching, such as DHI, implanter pen technique, canal opening procedure, ICE FUE method, robotic hair transplant, and so on, are actually some methods categorized under the FUE technique. There is limited scientific research to show that one of these techniques is superior to the others. To get detailed information on this topic, please visit Why DK Hair Clinic?. 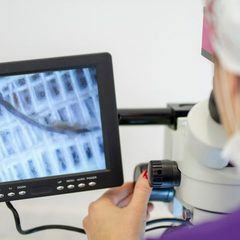 We use the FUE method at our clinic, as it has proven to be a successful hair transplant technique over the years, and we advise everyone to focus on the competence of the hair transplant clinic and their principles, rather than what technique to choose. What is the AQICS method? Copyright © 2018 DK Hair Klinik - All rights reserved.